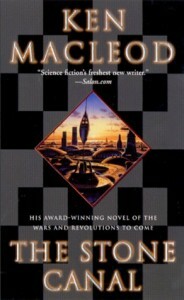 Ken MacLeod's second novel is simultaneously both a sequel and a prequel to “The Star Fraction”. The book is split into two main plot threads – one starts in Glasgow in 1970 and ends in orbit around Jupiter over a century later. The second plot thread takes place on a distant human colony called New Mars, several million light years (and a corresponding amount of time) away from the other plot thread. The New Mars plot thread starts with a clone appearing on the planet of New Mars. He has the memories of Jonathon Wilde, an anarchist politician who once controlled a nuclear arsenal and is blamed for losing World War 3. He finds himself in what initially seems like a nightmarish libertarian society of humans and intelligent androids who exist on the inhospitable planet. He meets up with a rebellious female android and discovers that his old friend and nemesis David Reid is now the ruler of New Mars. The Earth-based plot thread features the life story of Wilde, from his beginnings as a student politician in Glasgow through the tumultuous 21st Century as shown in “The Star Fraction”, and ending up as slave labour helping to build the New Mars wormhole for the “Fast Folk”, a group of powerful AIs who have developed their intellect far beyond human capacity. The plot is again highly original, although the New Mars setting does possibly feel a bit derivative of other dystopian science fiction settings. There are again plenty of ideas and concepts as well as some well-thought out technological advances, and description of the impact of those advances on society. Like his other books, this is very well written, although the prose is usually more straightforward than in “The Star Fraction”. The characters are generally interesting, although the motivation of some of the New Mars characters does seem a bit obscure. In general, the New Mars plot is largely less interesting and inferior to the Earth-based plot or the plot of “The Star Fraction”, relying too much on dystopian SF clichés and unlikeable characters, with the effect that this is possibly one of his lesser books. In summary, well-written and with plenty of good ideas but the sometimes tedious New Mars plot thread lets the book down a bit.